Drífa Snædal takes the helm at ASÍ during a time of great change, both within the trade union movement and in society. Demands for changes in leadership have come from many quarters. There have been an increase in demands for more transparency and a strengthening of democracy – more and more people show an interest in getting involved politically. But reactions within trade unions have been slower than in politics. The changes taking place there right now already happened ten years ago in political life. Drífa Snædal believes the development shows that trade unions are adapting to society’s demands. The atmosphere within the movement is heading back to the original grass roots mentality of old. She hopes workers again will become interested in joining trade unions, and that there will be a strengthening of democracy within the unions. People demanding better standards of living will hopefully also become more active in trade unions. “This represents the first step,” she insists. Drífa is taking over the ASÍ leadership at an interesting moment in time. The collective agreement period comes to an end in four months’ time, both for the private and public sectors in Iceland. Some demands have already been put forward for inclusion in a new agreement, and employers have already turned them down. It does not look like negotiations this winter will be easy. But there are many other issues that influence the negations, points out Drífa. Many Icelanders do not see their doctor, because it is too expensive. Living cost have become too high because of cuts to both housing and child benefits. Drífa explains that an increase in purchasing power has been divided unequally amongst the population. So the wage demands are now no longer just about salaries and living conditions, but also about social projects like creating more housing. “People feel living conditions are inadequate. Authorities have a role to play here,” she says. Workers and commercial employees have already presented their wage demands ahead of negotiations, while the craftsmen union has yet to do so. When all the trades have presented their demands, it will become clear what role ASÍ will have to play during negotiations. Drífa explains that the Icelandic negotiating system differs from that in other Nordic countries. In Iceland, each trade union is responsible for its own negotiations. The Confederation only enters into the negotiations if all the trade unions agree that they want it to. Iceland has received huge numbers of foreign workers in later years compared to what had so far been the case. The country has seen a similar development as other parts of Europe. There is a labour shortage which pushes up wages. Foreign workers are sometimes willing to work for lower pay than what is stipulated in the collective agreement. Trade unions have to deal with “the never-ending fight against labour market crime”, says Drífa. The public debate has shown that employers feel workers’ wage demands are sky high. But Drífa reminds us of the 2008 economic crash which meant people had to face severe wage cuts while the Icelandic krona was devalued. She underlines that Iceland has never enjoyed a stable economy. To aim for stability is a good thing, according to Drífa, who also points out that stability must include a well-functioning welfare system, a good healthcare system and wages which families can live on. “Stable poverty is not an alternative,” she says. Icelandic trade unions do not have to introduce the equal pay standard, because most of them are so small. But most municipalities must adhere to it, at least in part. ASÍ is just now introducing the equal pay standard in their own offices. In the rest of the Nordic region, the labour law is under pressure. The Finnish government wants to ease dismissal protection for people working in smaller companies. Drífa says that Iceland has managed to protect workers’ rights, and there are no signs those rights are being weakened. Drífa’s main interest is politics. She is critical to EU membership for Iceland. 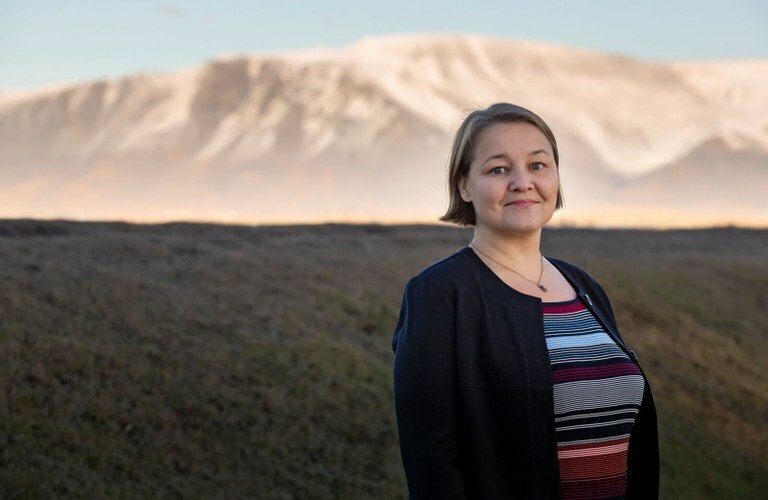 For 18 years she was a member of the Left-Green Movement, but left when the party entered into government with the conservative centre-right party Independence Party (Sjálfstæðisflokkurinn) and the centrist Progressive Party (Framsóknarflokkurinn). “I trust certain individuals within the party. I share an ideology with many party members. But I would have preferred a centre-left government. That would have made the coming winter easier for us,” she says. Sakfelling (Convicted), a collection of short stories from North Korea recently published by Angústúra. I am also listening to George Orwell’s 1984, and have started reading Sextíu kíló af sólskini (60 kilos of sunshine) by Hallgrímur Helgason. The computer, because it is the key to everything in my job. I wanted to be a police investigator. Knitting. That is a talent not many people know about. I have knitted a lot of Icelandic sweaters to friends and relatives. Drífa Snædal is 45 years old. She spent some of her childhood in Lund, Sweden. Has a daughter who is a student at the Grundtvig folk high school in Denmark. She attended the Geneva School herself last year. She first became active in the trade union movement in 1996 to 1998 as a leader of the association of vocational students in Iceland. Graduated from Lund University in 2012 after studying personnel and working life issues with focus on labour law. Formerly party secretary for the Left-Green Movement. Used to head the Reykjavik Women’s Shelter. Active on the left of Icelandic politics, in the fight for women’s rights and within the trade union movement. Listens Swedish Radio and watches documentaries and listens to podcasts.